The Jurassic is the one period of geological time that is widely known, thanks to Michael Crichton's novel Jurassic Park and Steven Spielberg's series of blockbuster films. But who knows where the name Jurassic comes from or who first named the period and its system of strata? Although the name Jurassic is derived from the continent of Europe, British strata and their fossils played a major role in the history and development of the system, and the very idea that somehow Jurassic times was a period dominated by the dinosaurs. As we have already seen, the dinosaurs were just as much part of the Cretaceous as the Jurassic, in fact they originated in Triassic times. But such is the power of a blockbuster film with worldwide distribution that for most people dinosaurs are inherently Jurassic. Initially this bit of Earth Time was not widely known as the Jurassic, but rather by the names of smaller and more regional divisions of strata. In William Smith's geological book of English strata they were known as the Oolites and Lias, names whose origin is lost in the vernacular tradition of centuries. Quarrymen characterised the limestones as Oolites because they seemed to be made from tiny egg-shaped grains (oon being Greek for egg, plus lithos, stone) and the Lias or Layers was so called simply because it typically consisted of regular alternating layers of thin limestones and shales. The intimate association of the Jurassic with the name 'dinosaur', which could well be the world's best-known scientific term, dates back to the first identification of the dinosaurs as a distinct group of fossils in the mid-nineteenth century. It was Richard Owen who in 1842 'invented' both the name and the idea of an entirely new group of extinct reptiles that were quite different from surviving land-living reptiles such as crocodiles, snakes and lizards. But, as we have seen (p. 99), Owen was building on the pioneering groundwork of Gideon Mantell and William Buckland. A ruthless and extremely ambitious man, Owen managed to step in at a crucial moment and steal the headlines. Just think how wealthy he would have become if he had been able to copyright the name dinosaur. The scientific importance of Jurassic strata and their fossils extends well beyond dinosaurs and their reptilian relatives, who not only dominated the landscapes of the period but also the seas and skies. It was because Jurassic strata are so well exposed in parts of Europe and are so fossiliferous that they promoted pioneering scientific work on how even small changes in fossils could be used to make fine subdivisions of strata, which could then be matched over considerable distances - the concept of biozonation (see below). Some of the most beautiful and picturesque landscapes of Britain, the Cotswold hills, are founded on Jurassic strata and especially the Oolitic limestones. The range of hills and valleys extends northeast from the magnificent eighteenth-century grandeur of the spa town of Bath, nestling in the valley of the River Avon where it cuts through the Cotswold Hills. The Cotswolds extend right across the country to the Lincoln and Yorkshire Wolds, where they run into the North Sea at Flamborough Head. From Bath the outcrop continues south, swinging through Dorset and out into the English Channel at Portland Bill and Durlston Head. The gentle, rolling hills and vales have an intimate, very human scale and are largely founded on differences in hardness of the underlying rocks. These vary from hard limestones, which form the upland wolds, to softer shales and marls, which form the valleys. Many of the older houses and farms are built of the local limestone; even the roofs are 'slated' with a kind of limestone. The limestones are so abundant and easy to work that they are also used to make the stone walls that enclose fields and separate one property from another. The overall effect is to make these 'manmade' structures appear as very much a natural part of the landscape. In places, there are ironstones that were extensively exploited in the past, but the main use has been the quarrying of the limestones for building stone and more recently for cement. William Smith was thoroughly at home in this, his geological 'backyard'. He knew all the subtle variations of the succession of strata, with ancient local names given them by quarrymen over the centuries. Smith could recognise all the distinctive local types of limestone such as the Portland Stone, Coral Rag, Cornbrash, Forest Marble and Fullers Earth Rock on how they appeared and what they were used for as well as their characteristic fossils. For instance, as Smith noted, the Forest Marble was 'wrought into slabs and chimney pieces' and Portland Stone 'provided fine stone of which Salisbury Cathedral is built' and many other of the country's most prestigious buildings. Similar strata are exposed across considerable stretches of the landscape of Europe, from southern Sweden down to the Mediterranean coast. Limestones, sandstones and shales of coastal cliffs and inland hills have been quarried for millennia since stone fortifications and other 'public works' were built by the Romans and Normans, along with the churches, cathedrals and castles of mediaeval Europe. There were other, more specialised uses for certain kinds of strata such as very fine-grained and platy limestones, which could be used for lithographic printing. As we shall see, it was the quarrying of some Bavarian lithographic limestones that was to reveal some of the most interesting and important fossils ever found. o and mining activity greatly enhanced the chances of finding significant new kinds of fossils and, most importantly, there was a growing intellectual interest in these fossil finds. Since the European Secondary (now known as Mesozoic and Tertiary) strata that were being quarried are largely marine sediments, most of the fossil remains were of creatures that lived in ancient seas. If the Mesozoic strata had been made of terrestrial deposits full of dinosaurs, such as is the case in much of the midwest of North America, the history of discovery would have been very different. First recognition of the Jurassic as a distinct system dates back to observations made by Alexander von Humboldt. 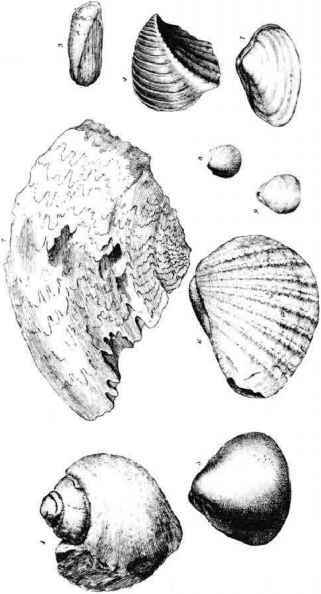 At the end of the eighteenth century, as he travelled around the flanks of the Alps, through southeastern France, western Switzerland and northern Italy, Humboldt noticed that the limestones of the Jura mountains, which are full of certain kinds of fossil corals and shellfish, seemed to form a distinct and separate rock unit in their own right, which he called the Jura-Kalkstein. However, it was not until 1839 that there was a more widespread use of the name Jurassic on the continent, with the publication of a general description of 'Jura' strata in Germany by another German, geologist Leopold von Buch. Baron Christian Leopold von Buch, 1774-1853, German geologist and student of Werner's. He became inspector of mines in the Prussian civil service (from 1796), compiled the first geological map of Germany (1832) and, in 1839, was first to describe the Jurassic System. In Britain, from the seventeenth century, a whole range of curious and unfamiliar fossils were being turned up by intensive quarrying along the several hundred miles of outcrop of Oolitic limestones and Liassic shales. Some of these finds were donated to the Ashmolean Museum in Oxford, which soon built up an internationally famous collection of petrified remains, including large bones of some unknown animals. These included the 10 kg knuckle end of a thigh bone that had been found in the seventeenth century in a local quarry and was described in 1677 by the first keeper of the museum, Dr Robert Plot, in his Natural History of Oxfordshire. Plot's initial diagnosis was that the bone was from an elephant imported into Britain during the Roman invasion. However, when he had the opportunity to compare the specimen directly with that of an elephant thigh bone, he had to admit that it was different and was forced to conclude that the fossil had 'exactly the figure of the lower most part of the Thigh-bone of a Man' who must have been a victim of the Flood. However, as we shall see it was actually much more interesting and was in fact one of the earliest discoveries of a dinosaur bone. Robert Plot, 1640-96, landowner and antiquarian, who became the first keeper of the Ashmolean Museum and professor of chemistry in Oxford (from 1683) and wrote a Natural History of Oxfordshire in 1699. At the end of the seventeenth century, the Oxford scholar and Keeper of the Ashmolean Museum, Edward Lhwyd, illustrated some fossil vertebrae in his 1699 book Lithophylacii Britannici Ichnographia. The fossils probably came from strata exposed along the banks of the river Severn, which we now know were deposited from the end of Triassic times into the beginning of Jurassic times. Lhwyd thought that they were fish backbones and so he called them Ichthyospondyli. We now know that they belonged to large, extinct marine reptiles such as ichthyosaurs and plesiosaurs. Edward Lhwyd, 1660-1709, antiquarian and Celtic scholar who became keeper of the Ashmolean Museum in Oxford and wrote Lithophylacii Britannia Ichnographia sive Lapidorum aliorumq. (1699) and Archaeologia Britannica (1707). acquired yet more puzzling bones, including teeth, which were found locally in the so-called Stonesfield slate. This Jurassic limestone was actively quarried in Oxfordshire because it could be split into thin slabs that were extensively used as roofing slates in the region. The limestone is often quite fossiliferous and when the quarrymen came across curious shells and bones they put them aside to be sold to collectors; some of these ended up the museum. The fossilised lower jaw of Buckland's giant reptile from Stonesfield, Oxfordshire still retains some of the serrated and blade-shaped teeth of a predatory carnivore. came from. The most obvious comparison was with a crocodile, but the fossil teeth were flattened and quite blade-like with serrated edges, while crocodile teeth are more conical and not serrated, although sometimes ridged. From the size of the thigh bone, Cuvier calculated that the original owner must have been more than 12 m (40 ft) long, with a bulk equivalent to that of an elephant over 2 m (7 ft) high. Although Buckland was alerted to this revolutionary diagnosis by Cuvier in 1818, he did not rush to publish it, perhaps because it hardly fitted into the biblical scheme of things that he wanted to promote. Not for another six years, until 1824, did Buckland get around to doing so, and then it was mainly because there were reports of some new giant bones being found in Sussex that were, he heard, being studied by Mantell. So on February 24th, 1824, Buckland took the opportunity to describe 'his' giant reptile at a meeting of the Geological Society in London, of which he just happened to be President at the time. He described the fragmentary Oxfordshire remains and explained how, from the teeth alone, the remains could be assigned to the lizard 'Order Sauria', within the 'Class Reptilia'. Since the bones had been found associated with the fossils of sea creatures, including crocodile and turtle remains, Buckland concluded that this extinct lizard 'was probably an amphibious animal', but could probably emerge to creep about on the land. 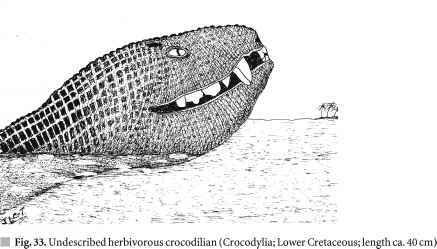 The image he created was that of a very big but still 'lowly, creeping serpent-like animal' and he gave it the name Megalosaurus, meaning 'great lizard'. In retrospect, we now know that this was the first dinosaur in the world to be 'christened' with a formal scientific name and it was found in the Jurassic age strata of southern England within deposits that are predominantly marine. But it was not the only historically important fossil of a terrestrial animal to be found in these shallow marine deposits.